There are many things that attract people to visit Saranda and we will name a few such as: the tranquil deep blue waters of Ionian Sea, the characterful small villages, natural site of ``Blue eye`` and the cultural and historic values of Butrinti (UNESCO). Due to its strategic position with the island of Corfu as its neighbour Saranda cruise tourism has sky rocketed in the recent years. Now Saranda port is enlisted as an important destination for all cruise ships covering the mediterranean. Saranda is the southernmost city of Albania with a population of about 20 000 inhabitants. The coastline washed by the waters of Ionian sea boasts of itself of crystal clear waters and small beaches hidden away from the civilisation with amazing vistas. 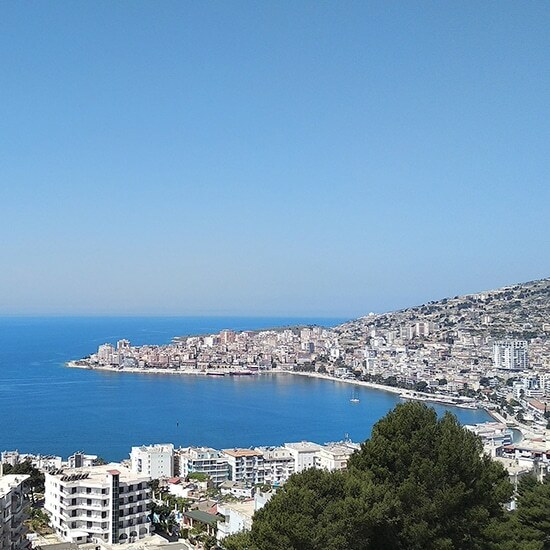 As you drive along the Albanian Riviera and around Saranda you will be impressed by the typical mediterranean climate characterised by mild winters and warm summers, a great place to be for those owning a vacation house in the city. The landscape of rocky hills terraced with citrus and olive groves and the evergreen vegetation make this place: a new mediterranean Love. It is considered as one of those beaches where you enjoy walking and stepping on the fine sand, and the place for families and children to enjoy some swimming during the hot summer days. Because of the Monastery of St.George in Deme, it has taken the same name. It is also a beach characterized by crystal waters and frequented from young people. Situated along the route to Ksamili, it is a beach with crystal water, with tiny white gravel and wonderful landscape. Mostly frequented by young people. Only 15 km away from Saranda, it is known for the colors of its marvelous water. It is a highly frequented beach from tourists all over the places. One of the most beautiful and famous bays of Saranda and Albania, very frequented because it contains also historical objects and places of worship to visit. Situated very close to the bay of Kakome, it is a magnificent beach which resembles to the white Caribbean bays. Accessible only by boat, because of the rugged landscape and the missing infrastructure in this area, Krorezi is also a virgin beach, with only a few small restaurants that serve fast food, or fresh fish. Situated along the road Sarande-Lukove, and achieved easily, just 2km from the national highway. A large and beautiful bay, it is crossed in the middle from the sweet waters of the river, which comes from the mountains, and on both sides there lies the beach with fine sand and quite appropriate for children and families. It is the longest beach in the whole Albanian Riviera, about 6 km. It’s almost virgin and sandstone, with some local structures of accommodation, which are set in this part of the coast. The beach is amazing, especially with its expansion which creates the idea of infinity. Situated at the top of the southern hill that dominates the bay of Saranda. From that point can be seen Korfuzi, Delvina, the Coast, Butrinti, and the valley of Pavlla. The castle was built in the XVII-th century, from the Ottoman empire that would control the Scaffolding of Saranda. This fortress has a square plan with ribs of 42 and 44 m and equipped with bulwarks and balls. Today the castle has been resorted and adapted into traditional restaurant, highly frequented, from which you can taste the hospitality and the surrounding landscape. Located near the west coast of Butrint. It was built in 1808 to protect the French fleet who was located at its bases in Corfu and Ionian islands. The castle has a rectangular shape with length a of 30m, and width of 22 m. It is made off four towers, two of which are round and facing the sea, while the other two towers have rectangular shape. The turrets of the guns were intended to prevent any potential landfall through enemy fleets to conquer Butrint through Vivari. Situated near Konispol, at the southern part of Saranda. The fortification was built on a hill that has the shape of a natural pyramid. Here was once an ancient city like Butrint, which belonged to the community of Prasaibs from the Illyrian Epirus. Together with its ruined walls, the archeologists have found public buildings, water cisterns, etc...unfortunately the city was destroyed by barbarian invasions in the V-th century. It was built in the XVII-th century, with a fortified style. Located on the Bay of Kakome. Situated on the southern bank of the Vivari channel, opposite the entrance to Butrint. It has a triangular shape in the corners and is equipped with round towers, in which the largest and the highest, is the southern one. In the inner part of the castle there are numbers of houses, which belonged to the former garrison. the castle is thought to be built by Anjuins in the XIII-th century. Later it spent various stages of reconstruction of the Venetians and Ali Pashe Tepelena. It is situated between Butrint and the mountain of Mile. It belongs to the antiquity time, and it functioned as a protection system for the main cities. During the Medieval Period it has otherwise been called the castle of Sopoti, and is situated near the Borshi village. According to the archeologists it surrounds the ancient city of those times, which belonged to the Homerik period. The city was surrounded by walls, and in this space was set the acropolis and also the public and private buildings. In the medieval period the town was called Sopoti, which retained the name until the Ottoman occupation. An evidence for this period is the mosque that was built up in a corner of the castle in XVIII-th century, which is visible to the visitors from the high way. Not far from the Kakome’s Monastery, located on a hill with a sunning view from the Ionian sea. It is thought that was built by the same person and at the same time with that of Kakome.